Schematic procedure of the MethylFlash™ m6A DNA Methylation ELISA Kit (Colorimetric). 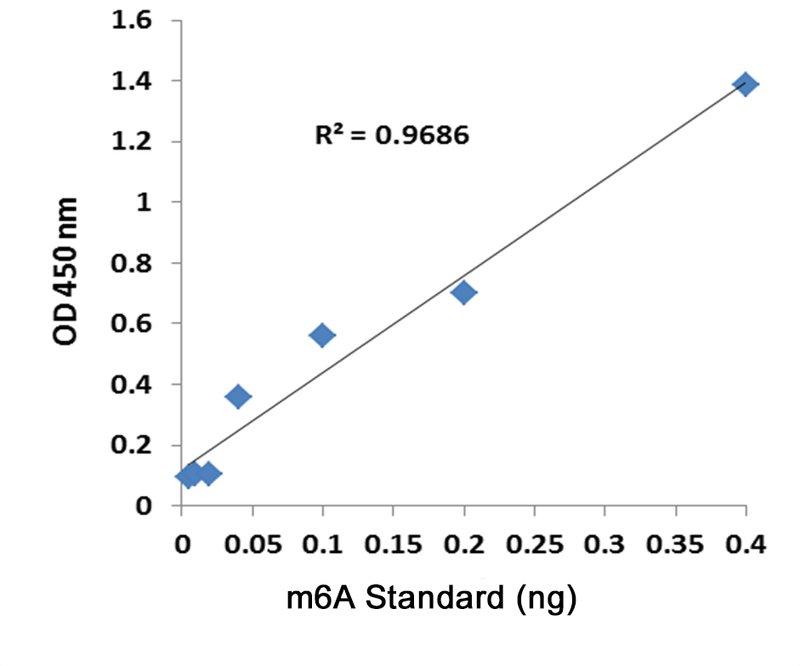 m6A standard control was added into the assay wells at different concentrations and then measured with the EpiQuik™ m6A DNA Methylation ELISA Kit (Colorimetric). Quantification of m6A content of various human DNA samples with the MethylFlash™ m6A DNA Methylation ELISA Kit (Colorimetric). Colorimetric assay with easy-to-follow steps for convenience and speed. The entire procedure can be completed within 3 hours and 45 minutes. 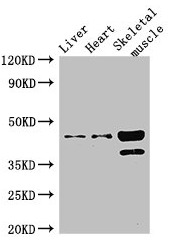 High sensitivity, of which the detection limit can be as low as 5 pg of m6A. Unique binding solution allows DNA >100 nts to be tightly bound to the wells, which enables quantification of m6A from both intact DNA or fragmented DNA such as ChIPed DNA. Optimized antibody and enhancer solutions allow high specificity to m6A, with no cross-reactivity to unmethylated adenosine within the indicated concentration range of the sample DNA. Universal positive and negative controls are included, which are suitable for quantifying m6A from any species. Strip-well microplate format makes the assay flexible for manual or high throughput analysis. N6-methyladenosine (m6A) is the most common and abundant modification on RNA molecules present in eukaryotes. DNA m6A is also identified in multicellular eukaryotes including Caenorhabditis elegans and Drosophila melanogaster, and furthermore identified in higher eukaryotes including plants, mouse and human cells. m6A plays crucial roles in regulating DNA replication, transposition, transcription, and cellular defense. In humans, the DNA m6A modification is most likely catalyzed by a methyltransferase complex METTL3 and removed by the α-ketoglutarate (α-KG)- and Fe2+-dependent dioxygenases such as ALKBH5 and TET-like enzymes. It was shown that METTL3 and α-KG /Fe2+-dependent dioxygenases play important roles in many biological processes, ranging from development and metabolism to fertility. The dynamic and reversible chemical m6A modification on DNA may also serve as a novel epigenetic marker of profound biological significance. Down-regulation of m6A modification was first characterized in human cancer cells and tissues, relative to their normal controls. m6A is found to be the most regulated DNA modification in cancers. In addition to the regulation in cancer cells, relative to the primary cell/tissues which contain quite low amounts of DNA m6A (<0.001%), a hundreds-fold increase of m6A modification was found for in vitro cultured human cells (0.03%-0.22%). Therefore, identifying m6A DNA methylation levels and distribution on DNA could advance understanding of epigenetic regulation of biological process at the genomic level, and further provide useful information for improving diagnostics and therapeutics of disease. This kit contains all reagents necessary for the quantification of m6A in DNA. 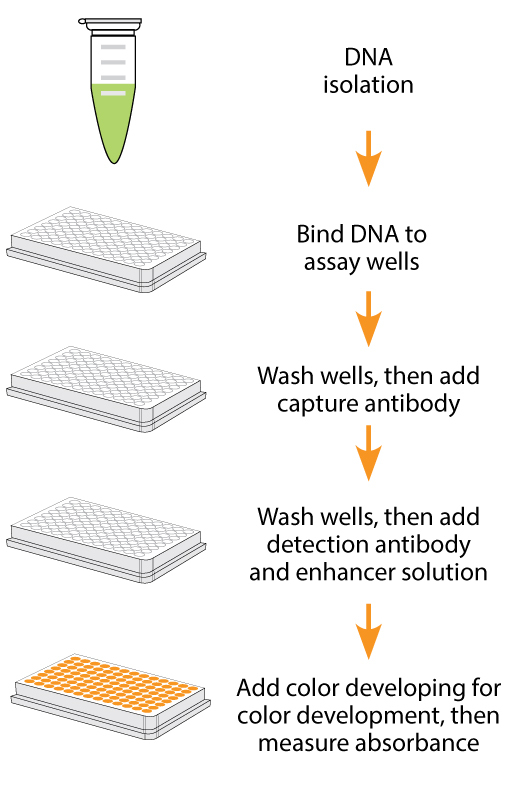 In this assay, DNA is bound to strip wells using DNA high binding solution. m6A is detected using capture and detection antibodies. The detected signal is enhanced and then quantified colorimetrically by reading the absorbance in a microplate spectrophotometer. 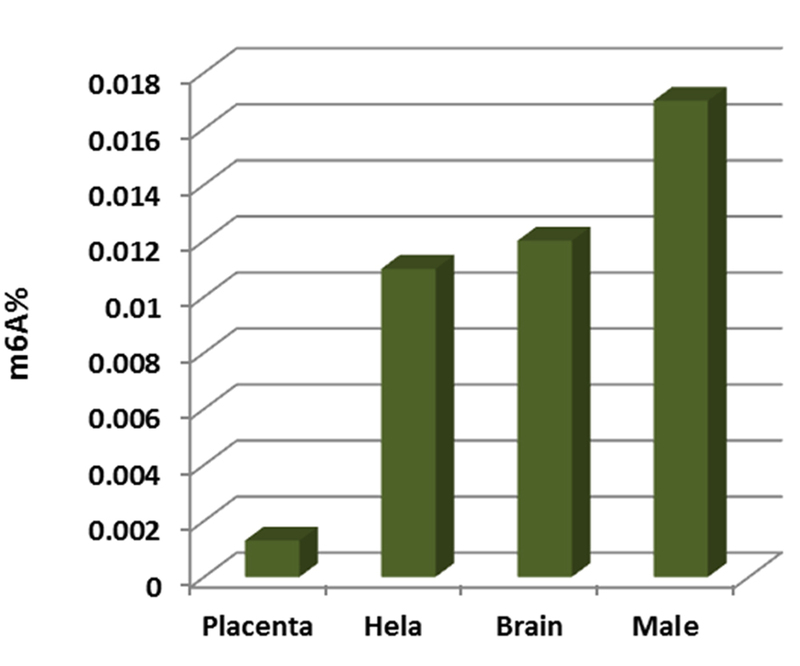 The amount of m6A is proportional to the OD intensity measured. Starting materials can include various tissue or cell samples such as cells from flask or microplate cultured cells, fresh and frozen tissues, paraffin-embedded tissues, blood, body fluid samples, etc. * Spin the solution down to the bottom prior to use. McIntyre ABR et. al. (February 2019). Single-molecule sequencing detection of N6-methyladenine in microbial reference materials. Nat Commun. 10(1):579.